About 90% of workers at Japan's Fukushima nuclear plant fled at the height of the meltdown crisis in 2011, a Japanese newspaper has reported. The Asahi Shimbun said the report was based on transcripts of interviews - stored in the prime minister's office until now - with the plant director. 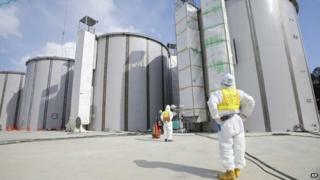 It differs from the account of the plant's operator, Tepco, which said that workers were told to leave. The plant was damaged by a quake and tsunami and has faced multiple issues. Four reactors were severely damaged by the disaster that struck in March 2011. Some of the setbacks at Fukushima include worker errors and a series of toxic water leaks and power cuts. When disaster struck the plant three years ago, there were about 720 workers on the site. For three days, they struggled as one reactor after another began to meltdown. But on the fourth day, the Asahi Shimbun said that 650 workers fled, leaving fewer than 70 employees to deal with the crisis. The report is based on more than 400 pages of transcripts of interviews prosecutors conducted with the former Fukushima plant director, Masao Yoshida, after the disaster. Mr Yoshida, who died of cancer last year, was questioned 13 times in 2011, the paper said. "At 06:42 am, Yoshida ordered workers to temporarily evacuate to locations at the plant site where radiation levels were comparatively low," the paper said, adding that the workers were told "to wait in locations from where they could immediately return to their posts". "He added that the workers would be asked to return once confirmation was made that there were no abnormalities." However, many fled, including the plant's group managers, he was quoted as saying. Other workers eventually returned to the plant later on, he said. The Tokyo Electric Power Company (Tepco) "has never mentioned the orders Yoshida issued on March 15, 2011", the paper said. "The company now says Yoshida's orders were flexible, and that no breaches of company rules occurred," it added.